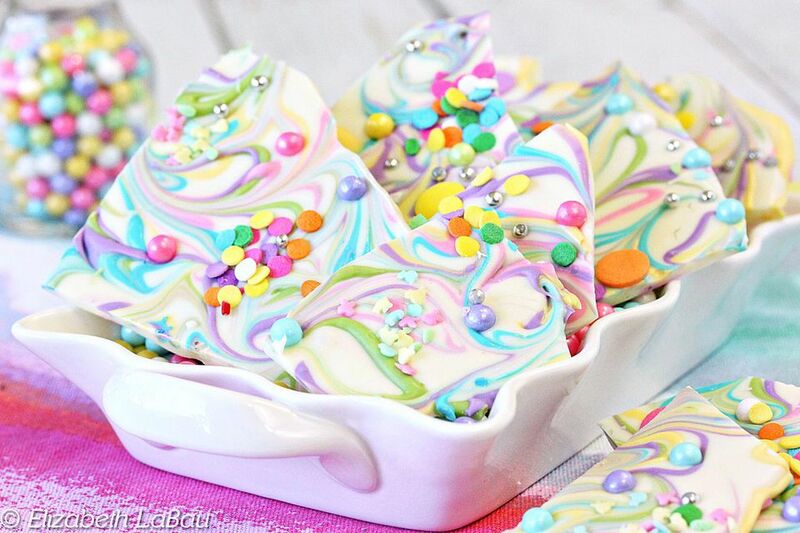 This recipe for unicorn bark is awash with pastel swirls and all kinds of colorful, sparkling candy pearls and sprinkles. Serve it at a shower, gift it as a party favor, or use it to decorate cakes or cupcakes. Candy should be fun, and this unicorn bark never fails to make people smile. Cover a baking sheet with waxed paper or aluminum foil. Melt the white and colored candy coating separately in the microwave, each in individual bowls. Heat and stir until ever color is smooth and fluid. Pour the white coating out onto the baking sheet, and smooth it into an even layer about 1/4-inch thick. Working quickly, drizzle the other colors of candy coating over the white coating in a random pattern. Drag a toothpick or knife through the bark to create pretty swirls. While the coating is still wet, add rainbow sprinkles and candy pearls on top. Refrigerate the tray to set the bark for at least 25 minutes. Once set, break or cut the bark into pieces. Use the pieces to decorate cupcakes or cakes. For this recipe, you'll need an assortment of colored candy coating. You can buy different colors of candy coating, or use candy coloring to dye white coating different shades. Candy coloring is different from regular food coloring—it's oil-based, whereas food coloring is water-based and doesn't work well with chocolate. If you want to go this route, candy coloring can be found online, and at many cake and candy supply stores.